Janice, Gelli and kids in HK Disneyland! The tourists wore color-matching clothes for each day of their Disneyland vacation—red on the first day, green on the second day, and blue on the last. "Para hindi mahirapan maghanapan sa loob ng Disney," Gelli de Belen explains. Real-life sisters Janice and Gelli de Belen love to travel, and that love has rubbed off on their kids. 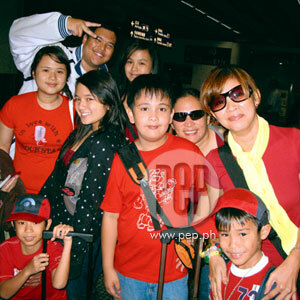 Last April 2008, the families of the two sisters—along with their dad and mom, the kids' Lolo Phillip and Lola Susan—flew to Hong Kong Disneyland for their annual summer vacation. Gelli says they had been planning this family-bonding time since February, and everyone was excited. The best experience from the trip was "just being together," she says. "We were together the whole time there, at ang saya!" Going over the photos that chronicled the Disneyland excursion, and noting the absence of her husband, Ariel Rivera, in most of the shots, Gellie laughingly explains: "Wala masyadong picture si Ariel, kasi siya ang photographer. Hahaha!"